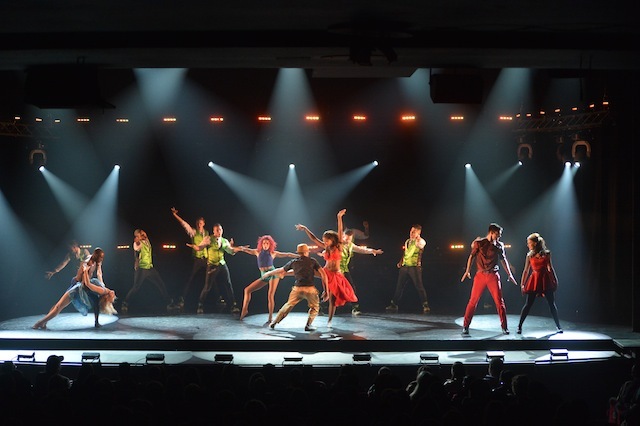 Although assigned to the more typical setting of the Theatre, Flash Mob embraces the care free, live for the moment spirit of the dance craze. Showcasing the talents of some of the UKs brightest and boldest dance acts, Flash Mob combines the technological world of social media with the humanistic nuances of choreographed routines. Playful in structure, the production initially takes the form of a love story, chronicling a couple’s journey from first date to engagement. Captured by dance duo Renako McDonald and Nicolette Whitley, better known as Alleviate, the pair humorously embody the not so graceful elements of the much dreaded first date with the heart felt romanticism of the marriage proposal. The dance duo encapsulate a chemistry that can not be taught, beautifully contributing their signature style of lyrical hip hop, balletic kicks and fearless tricks. Social Media makes its presence known via the light hearted exchanges of the cast. Text alerts and 140 character Twitter status’ project thoughts onstage, Social Media taking on the role of the narrator. Uniting the ensemble in celebratory group numbers, each cast member is not only able to show off their individual specialisms, but also fuse genres and paint a unique dance tapestry! The production, in the second half evolves into a fragmented labyrinth of miniature scenarios, varying from the stylish and raucous underworld of the Jazz Bar to the isolated and confined environment of a prison unit. Strictly Come Dancing‘s Kevin Clifton and Karen Hauer own the stage, treating the audience to a masterclass in panache, technique and charisma. Greeted by a loud round of cheers and applause, the dancing couple proceed to show exactly why they have obtained popularity within the last year. Tommy Franzen of So You Think You Can Dance fame imaginatively updates the traditional circus art form of clowning into a contemporary comical performance. Fusing Hip Hop with Slapstick, clumsy yet poised Franzen immediately has the audience on side. Britain’s Got Talent finalists Flawless bring to the table their defining trademark of precision and geometric formations, showcasing the umbrella of Hip Hop from outlandish contortions to Krump.